Background and Purpose: Recent research indicates that a weed like Indigobush (Amorpha fruticosa L.) gives great opportunities for its commercialization through a rich spectrum of its beneficial biological features with possible use in the forestry and biotechnology field. Therefore, in this study we wanted to explore some of potential application of Indigobush extract, as a source of biologically active compounds, for animal cell culturing as well as green corrosion inhibitors. Materials and Methods: The effect of ethanol extract of Indigobush seeds was studied on human tumor cell lines (HeLa and MCF-7) and cell viability was determined by WST-1 method after 72 hours of treatment with 6 different extract concentrations (0.5-10 mg∙mL-1). The inhibition effect of Indigobush seeds extract on the corrosion of aluminum in 0.5 M hydrochloric acid solution was investigated by potentiodynamic polarization and electrochemical impedance spectroscopy (EIS) methods. Results: Results showed that the addition of Indigobush extract had a stimulatory effect on MCF-7 cells growth at the concentrations >1 mg∙mL-1 while the same effect on HeLa cells was observed only at the highest concentration of Indigobush extract (10 mg∙mL-1). The stimulatory effect of Indigobush extract on cell viability was more pronounced when the cells were grown in a medium with 5% FBS compared to 10% FBS (v/v). Indigobush extract did not show cytotoxic effect on MCF-7 and HeLa cells. Electrochemical studies showed that with increasing extract concentrations (2.5-15 mg∙mL-1) the values of corrosion current densities decrease, while the polarization resistance values increase. The maximum inhibition efficiency of Indigobush extract is reached at concentration of 15 mg∙mL-1 (82.9%). Conclusions: The Indigobush ethanol extract has no cytotoxic effect on human tumor cell lines MCF-7 and HeLa. Results confirmed that extract originated from Indigobush has the potential to utilize for the mammalian cell culture media formulation by replacing the animal serum. Furthermore, data indicates that Indigobush extract has potential as green alternative to existing synthetic corrosion inhibitors. Indigobush (Amorpha fruticosa L.) belongs to the genus of deciduous shrubs and semi-shrubs (Amorpha L.) from the Fabaceae family. The range of its natural habitat is from southern Canada to Mexico. It was introduced to Europe in the first half of 18th century. In Croatia it is present since the beginning of 20th century in the valleys of the rivers Sava, Drava and Kupa in the lowland oak forests. According to the recent investigation Indigobush is the most common in Posavina region  . It is an upright shrub which can reach 3 meters in height and spread to twice that in width. The leaves are pinnately compound. The violet flowers that appear in June-July are in upright narrow racemes that can be clustered or solitary. The fruits are tiny warty pods, each containing one seed. It tolerates poor site conditions, prefers neutral, low-acid and low-alkaline soils. It can grow in semi-shade or no shade and requires moist soil, so it can be found along riversides and streams from where its seed spread by water, especially floods. Because of its quick and rich growth it rapidly conquers forest habitats as weed species, and is often a limiting factor for forest regeneration. It forms a dense shrub level in the shade of the old oak and ash trees and competes with young plants for water and nutrients . Because of that Indigobush is considered as an undesirable species in forestry, but recent research indicates that it is a plant of potentially great significance from economic aspect. It can be used for making blue dye, insecticides, repellents, perfumes, margarines and spices. Dense bushes make good cover for the animals and its twigs can be used for making flower arrangements and baskets. The great value of Indigobush is in its oil which can be used as biofuel and, if refined, as edible oil. The apiarist worship Indigobush as a rich honey producing crop . With its root system preserve the soil from erosion as dense bushes planted in lines are making excellent protection against wind. In the USA, Indigobush is cultivated as decorative bush. Indigobush biomass research and its potentially bioenergetics value are extremely interested for the economy  . Indigobush seed is extremely viable and doesn’t show any indications of germination loss, neither the viability loss during the storage. The results of germination tests of fresh seed imply at the phenomenon of seed dormancy due to the tightness of the seed shell . The plants and their extracts have long been recognized to provide a potential source of chemical compounds or more commonly products known as phytochemicals with potent biological activity. Although leaves, roots, flowers, whole plants and stems were examined for useful phytochemicals in many studies, few reports refer to seeds as source for phytochemicals. Yet, a large number of chemical compounds are present in seeds or seed coats, including alkaloids, lectins and phenolic compounds . Also, Indigobush as a promising reservoir for biologically active compounds has been recognized and studied in recent years. Published studies indicate the presence of various phenolic compounds in the Indigobush extracts. Three different isoflavones and five rotenoides were purified from Indigobush. The Indigobush beans gland contains about 3.5% of oil which is composed of various terpenes. The Indigobush seed is composed of fatty acids including linoleic, oleic, palmitic and stearic acid , , . In 1943 glycoside amorphin, which is applied as a drug for nerve and heart disease, was isolated from Indigobush fruits . According to Zheleva-Dimitrova , Indigobush extract shows antioxidant activity and could be useful in therapy of free radical pathologies and neurodegenerative disorders. Despite the fact it contains so many useful substances, Indigobush is mainly used for erosion control and to restore wasteland. In this study, we wanted to explore some of potential application of Indigobush extract, as a source of biologically active compounds, for animal cell culturing as well as green corrosion inhibitors. Effects of ethanol extract of Indigobush on the viability of human tumor cell lines (HeLa and MCF-7) as well as possibility of partial substitution of animal serum with extract of Indigobush were studied. Also, the inhibition effect of Indigobush extract on the corrosion of aluminum in 0.5 M hydrochloric acid solution was investigated by potentiodynamic polarization and electrochemical impedance spectroscopy (EIS) methods. Seeds were collected in natural stand of Indigobush on the area of Forest office Sunja, Forest administration Sisak in 2012. The seeds were ground to fine powder and extracted with 300 mL of 96% ethanol at the reflux temperature for 2 hours. The crude extract (0.05 g∙mL-1) was then filtered through filter paper. For determination of biological activity of extract, aliquot was taken, sterile filtered (0.22 µm) and stored at -20°C before use. Human tumor cell lines MCF-7 (breast adenocarcinoma; ATCC: HTB-22) and HeLa (cervical carcinoma; ATCC: CCL-2), purchased from American Type Culture Collection (ATCC) were cultured in 25 cm2 T-flasks in Dulbecco’s Modified Eagle’s Medium (DMEM, Gibco, UK) supplemented with 5 or 10% (v/v) fetal bovine serum (FBS, Gibco, UK) and maintained in a humidified atmosphere of 5% CO2 at 37°C. Corrosion tests were performed using coupons prepared from 99.85% pure aluminum. A specific volume of prepared extract was taken and added directly to 0.5 M HCl solution to prepare the desired concentrations in range from 2.5-15 mg mL-1. where R’ct and Rct are charge transfer resistance with and without inhibitor, respectively . To evaluate cytotoxicity of Indigobush ethanol extract on human tumor cell lines MCF-7 and HeLa following 72 h-exposure we used WST-1 cell proliferation assay. The effect of different extract concentrations on both human tumor cell lines, expressed as a percentage of control, are summarized and shown in Figure 1. Results showed that the addition of Indigobush extract had stimulatory effect on MCF-7 cells growth at the extract concentrations higher than 1 mg∙mL-1. There was no stimula-tory effect on HeLa cells, except at the highest concentration of Indigobush extract (10 mg∙mL-1). Similarly, the positive effect on the growth of human T-cells (approximately +15%) was observed with the addition of 0.5 g∙L-1 of selected Indigobush fruit extracts compared to the control . In the same study, the methanol fruit extract of Indigobush showed relatively low cytotoxicity of 19% at a maximum concentration of 1 g∙L-1 in normal human lung cell line (HEL299). Despite relatively high tested concentration of the extract (10 mg∙mL-1), in our study, cytotoxic effect on both human tumor cell lines was not observed. 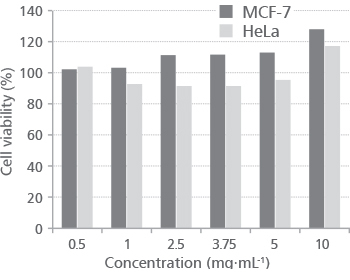 Since the positive effect of Indigobush extract on MCF-7 and HeLa cells growth was observed, we were interested in whether the effect will be visible when cells were cultured at reduced volume of serum (5%). Therefore, we established experiment where the cells were plated in medium with 5% and 10% of FBS. After 24 h cells were treated with 10 mg∙mL-1 of Indigobush extract since that concentration caused the most pronounced growth stimulation of MCF-7 and HeLa cells. The cell viability was determined by WST-1 assay after 72 h of exposure. The results are shown in Figure 2. Results showed that the stimulatory effect of Indigobush extract on cell viability is more pronounced when the cells were grown in a medium with 5% FBS compared to 10% FBS (v/v). 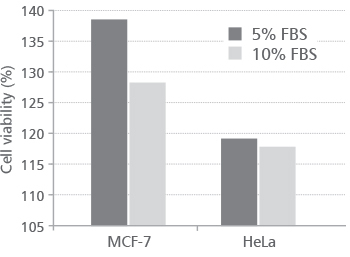 This difference is more significant for MCF-7 than HeLa cells. Also, the stimulatory effect of Indigobush ethanol extract on cell viability is stronger on MCF-7 cells compared to HeLa cells, which may indicate the specificity of action with respect to the cell type. Obtained results provide useful information for the utilization of Indigobush extract as medium additive or as a substitute for serum since various plant components have been proposed to replace serum in mammalian cell cultures . However, more extensive research will be required to determine the qualitative and quantitative composition of the Indigobush extract and its mechanism of action, as crude extract and individual fractions or pure components. Also, it would be interesting to prepare a hydrolyzate of the plant and to examine its effect on different cell lines, since such data are not available in the literature and contribute to changing attitudes towards Indigobush as harmful and useless plant species. Aluminum is widely used in many industries, such as, the production of heat exchangers, filters, various containers, printing plates etc. and often comes into contact with different aggressive media that can cause significant corrosion. The addition of corrosion inhibitors in aggressive media is one of the frequently used methods for corrosion protection. Nowadays, a new class of corrosion inhibitors with low toxicity and good efficiency are plant extracts, therefore the exploration of natural products of plant origin as an inexpensive and green corrosion inhibitors is an essential field of study , , . One of the goals of this research was to investigate the effects of Indigobush extract as complex system on corrosion of aluminum in 0.5 M HCl solution. Corrosion parameters were performed by using electrochemical measurements (potentiodynamic polarization and electrochemical impedance spectroscopy) (Table 1 and Figure 3). In acidic solutions the main anodic reaction is the dissolution of aluminum in the form of Al3+ aqueous complexes and their passage from the metal surface into the solution, while the main cathodic reaction is a reduction of hydrogen ions and evolution of hydrogen gas . Therefore, the inhibitor can influence on either the anodic or the cathodic reaction, or both. 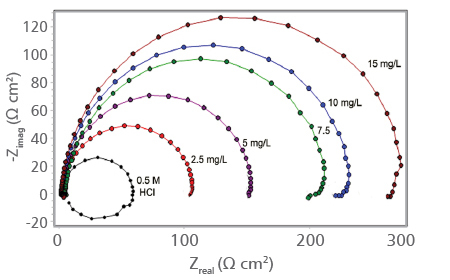 Potentiodynamic polarization curves obtained for aluminum in 0.5 MHCl solution in the absence and presence of various concentrations of Indigobush extract at 25°C are shown in Figure 3a. 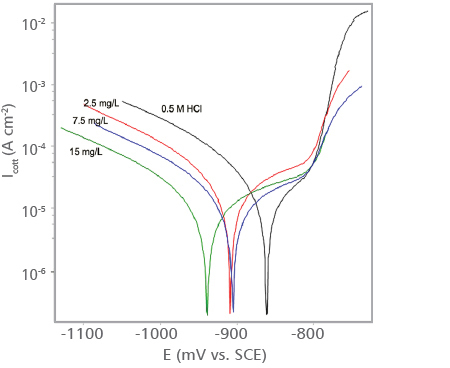 From this figure is evident that addition of Indigobush extract in HCl solution causes remarkable decrease in current densities and shifts the corrosion potentials in cathodic direction. Inhibition efficiency (ηp (%)) values increase with increasing extract concentration and reach a maximum value of 82.9% for addition of 15 mg∙mL-1 Indigobush extract. The effects of different concentrations of Indigobush extract on the impedance behaviour of aluminum in 0.5 M HCl solution have been obtained and results are given as Nyquist plots in Figure 3b. By addition of inhibitor to the HCl solution, the diameter of the capacitive loop enlarges, this means that the charge transfer resistance, Rct values increase and an improvement in corrosion resistance of aluminum in acid solution is achieved. The calculated EIS parameters for aluminum in 0.5 M HCl solution containing different concentrations of Indigobush extract are also presented in Table 1. Inspection of these parameters reveals that the charge transfer resistance, Rct values increase, while CPE (constant phase element) decrease with the increasing concentration of Indigobush extract. The decrease of CPE values can result from an increase in the thickness of the electrical double layer and suggests the active molecule adsorption on aluminum surface. This also confirms that compact film of inhibitor is formed on the aluminum surface, which acting as a physical barrier for preventing the attack of the aggressive hydrochloric acid solution. This could be mainly attributed to the physical adsorption of active molecules present in Indigobush extract and adsorption process is possible because active molecules largely exist in the protonated form in acid solution. These protonated species can be adsorbed on the cathodic site of the aluminum decreasing the hydrogen evolution reaction. Calculated inhibition efficiency values (ηEIS (%)) reach a maximum value in presence of 15 mg L-1 Indigobush extract (78.4%) and they are quite similar whit efficiency values obtained by potentiodynamic polarization method. Electrochemical results revealed that Indigobush extract is a good eco-friendly inhibitor for the corrosion control of aluminum in 0.5 M hydrochloric acid. Inhibition efficiency values increases with increasing Indigobush extract concentration, reaching a maximum value at concentration of 15 mg∙mL-1 (82.9%). Indigobush extract can be used as renewable and easily available inhibitor for aluminum corrosion. These results confirmed that plant extracts originated from invasive plants like Indigobush can be used directly to develop new and effective classes of natural chemicals with potential application in various green technologies. This study will contribute to changing attitudes towards Indigobush as harmful and useless plant species. Furthermore, results obtained in this study showed that Indigobush extract has the potential to utilize for the mammalian cell culture media formulation by replacing the animal serum and as green alternative to existing synthetic corrosion inhibitors. However, more extensive research will be required to determine the qualitative and quantitative composition of the Indigobush extract. Within these challenges, screening native plants in general is useful for revealing antimicrobial, antioxidant activity and antitumor activity that may lead to the development of new products for use as nutritional and pharmaceutical agents.